Preferred by DVD drive manufacturers, Verbatim DVD media continues to set the standard for high-speed disc performance, reliability, and compatibility. 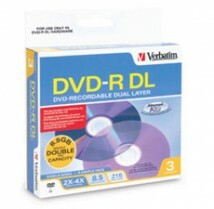 DVD-R Dual Layer nearly doubles the storage capacity with two AZO recording layers on a single-sided disc. Compatible and supported by dual layer hardware from Pioneer, Plextor, Sony & other leading 2X-4X Dual Layer manufacturers. Store up to 8.5GB of video while maintaining compatibility with most DVD video players or DVD-ROM drives. All backed by Verbatim’s limited lifetime warranty.